By Johan Scheel. 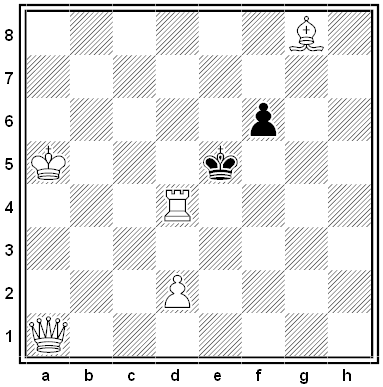 White to mate in two moves. White wins with the surprising 1. Qa3! 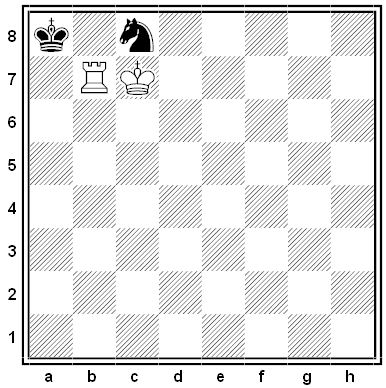 No matter how Black responds, the queen or rook will mate next move. From Casopis ceských šachistu, 1916. 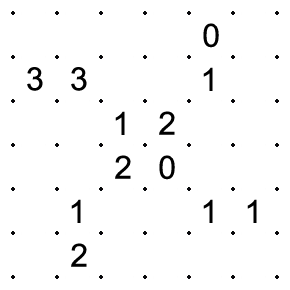 In this original logic puzzle by the Japanese publisher Nikoli, the goal is to connect lattice points to draw a closed loop so that each number in the grid denotes the number of sides on which the finished loop bounds its cell, as above: Each cell bearing a “1” is bounded on 1 side, a “2” on 2 sides, and so on. By Harry Viggo Tuxen. 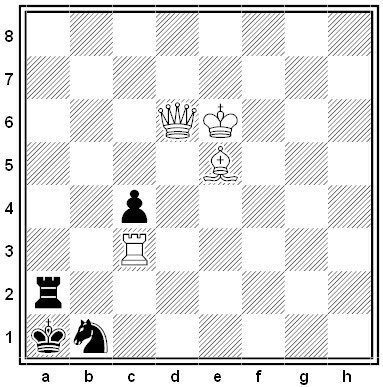 White to mate in two moves. 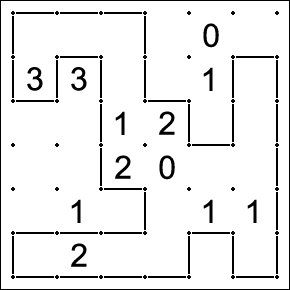 A puzzle by University College London mathematician Matthew Scroggs: A princess lives in a row of 17 rooms. Each day she moves to a new room adjacent to the last one (e.g., if she sleeps in Room 5 on one night, then she’ll sleep in Room 4 or Room 6 the following night). You can open one door each night. If you find her you’ll become her prince. Can you find her in a finite number of moves? Here’s one way to do it. 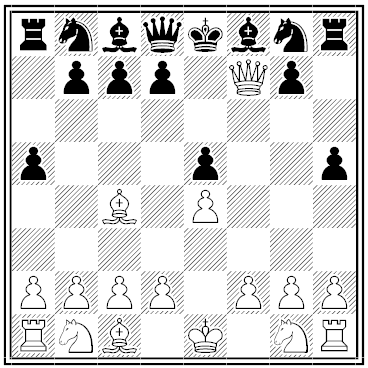 Imagine a chessboard with 17 files and a large number of ranks. Each file represents one room, and each rank represents one night. On each night (rank), mark the room (square) where the princess is sleeping. Because the princess moves to an adjacent room each day, the marker will always move “diagonally” on the board, and hence will always occupy squares of the same color. Check the 17th room on the first night, the 16th on the second night, and so on. Suppose the 17th square in the first row is white. If the princess started on a white square, this will find her, as the diagonal you’re drawing must eventually intercept her path. If you reach Room 1 without finding her, this means she’s been traversing black squares. Go immediately back to Room 17 (which will be represented by a black square on row 18), and work your way down as before. This time your paths must cross. From Raymond Smullyan: Every inhabitant of this island either a knight or a knave. Knights always tell the truth, and knaves always lie. Further, every inhabitant is either mad or sane. Sane inhabitants always answer questions correctly, and mad ones always answer incorrectly. You meet an inhabitant of the island and want to know whether he’s sane or mad. How can you determine this with a single yes-or-no question? Ask, “Are you a knight?” A sane knight will say yes, a mad knight will say no, a sane knave will say yes, and a mad knave will say no. So a sane inhabitant will answer yes and a mad inhabitant will answer no.